Every year, Sainsbury’s invite customers to have a say in what beers the supermarket will be selling the following year. They call it the Great British Beer Hunt. This year I was fortunate enough to be one of those beer testers. The event took place in the Salford City Reds Rugby Stadium in Eccles, Manchester. I arrived on time at 2pm and after a short introduction, we were given our scoring cards and asked to start. 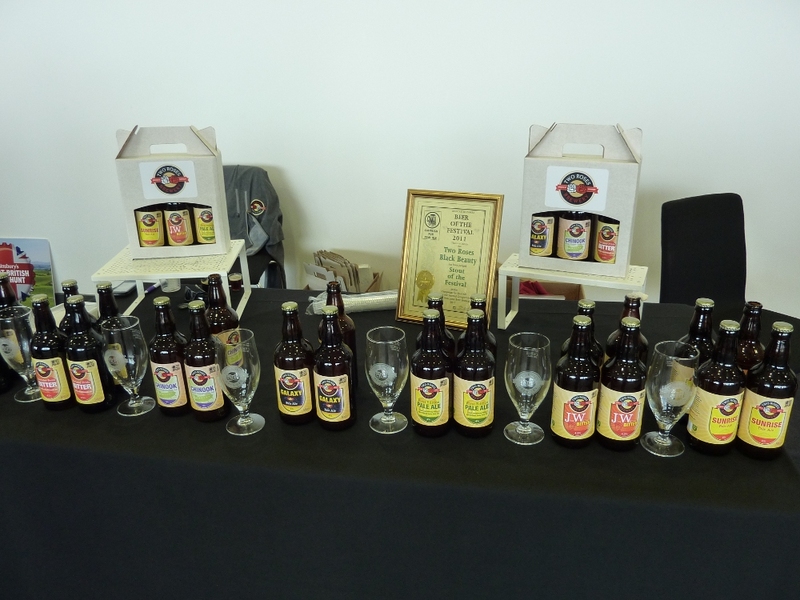 There were 23 bottled beers on offer, of which we had to choose eight, and of those eight, vote for four. In no particular order, I chose Two Roses First Edition, Weetwood Eastgate, Cropton Yorkshire Moors, Little Valley Stoodley Stout, Cropton Blackout, Little Valley Tods Blonde, Bateman’s Mocha and Cropton Madman’s Slaughter. I took my tray to the bar where the chosen beers were served into small plastic beakers. 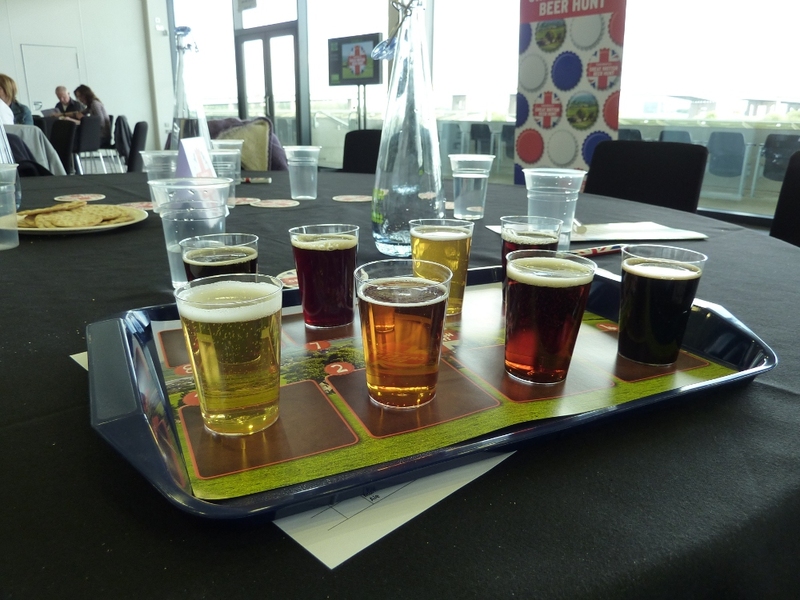 I also sampled different beers from my mate’s tray. Two Roses First Edition, a 4% golden ale with a lovely pale yellow colour. The smell was bright and hoppy, and the taste was wonderfully fruity and hoppy with plenty of grapefruit pith. This beer just blew me away, I really hope it gets selected, as it would be perfect for a summer’s afternoon. A truly wonderful beer. Little Valley Stoodley Stout. I recently had this beer on tap at the Port Street Beer House in Manchester – see here. It’s a 4.8% stout, just about black in colour with a fine brown head. The taste is rich, sweet, malty and dark with some smoke and a touch of dryness. The mouthfeel is distinctly creamy. A fabulously complex taste. Cropton Blackout. A 5.0% porter. I had this from the cask at last year’s York Beer Festival. My review of it is here. The bottle didn’t disappoint. The smell is inviting – sweet, toffee notes promising something really good. The taste includes toffee and chocolate hints with a smooth, dryish finish. Beautiful. Bateman’s Mocha. With a name like ‘Mocha’, there’s a certain expectation of what it’s going to taste like. And yes, it does. It’s a very dark brown in colour, 6% ABV. The smell is a subtle mix of chocolate and smoke, with the chocolate being dominant. The taste is very smooth and creamy with chocolate and dark coffee notes. It’s a stunningly good beer. The one I had difficulty with and only dropped reluctantly, was Weetwood Eastgate, a beer I haven’t seen in bottles before (one of the stipulations for entry into the Sainsbury’s Great British Beer Hunt was that the beer should be new, or new to bottles). I’ve had it on draught, and the draught version is superb. Slightly deceptively, the beer looks like a fairly ordinary bitter, amber in colour, but the taste is utterly gorgeous – smooth, creamy, fruity, sweet and beautifully rounded. My difficulty is that the bottled version is not quite as good. It’s still very good, but perhaps lacking a little something that the cask version has. 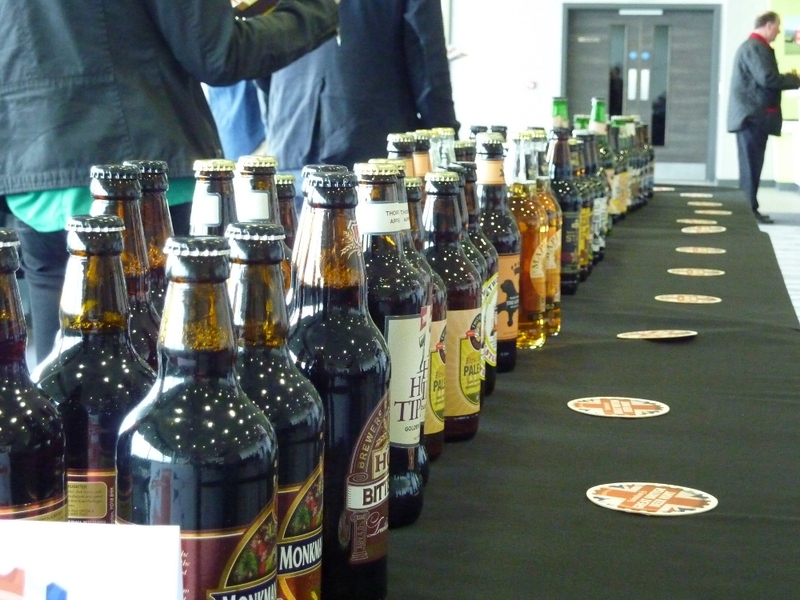 Having cast our votes, we walked along a corridor into another large room, where ten brewers had stands and were offering tastes of their beer and were either giving bottles away free or selling them at a much reduced price. Brewers present were from Two Roses, Weetwood, Cropton, Little Valley, Bateman’s, Thwaites, Lees, Stringer’s, Beartown and Holts. I spent longer in that room than I did in the tasting, and drank considerably more beer!The brewers were all very approachable and interesting, and I learned a lot from chatting with them. In all this was a fantastic free way to spend an afternoon. I’ll be looking out for next year’s event, and booking my ticket early. This blog continues from Part 2 of my pub crawl round Sheffield, which can be found here. Leaving The Hop, we ventured out into the night, initially making for the Bath Hotel on Victoria Street. This pub has been sympathetically restored to its 1930s splendour, and has won a place on CAMRA’s National Inventory of historic pub interiors. Sadly, on this occasion, it was very crowded and we were unable to sit, and standing was quite a jostly affair, so we moved on to our next target, a long walk to the University Arms on Brook Hill. 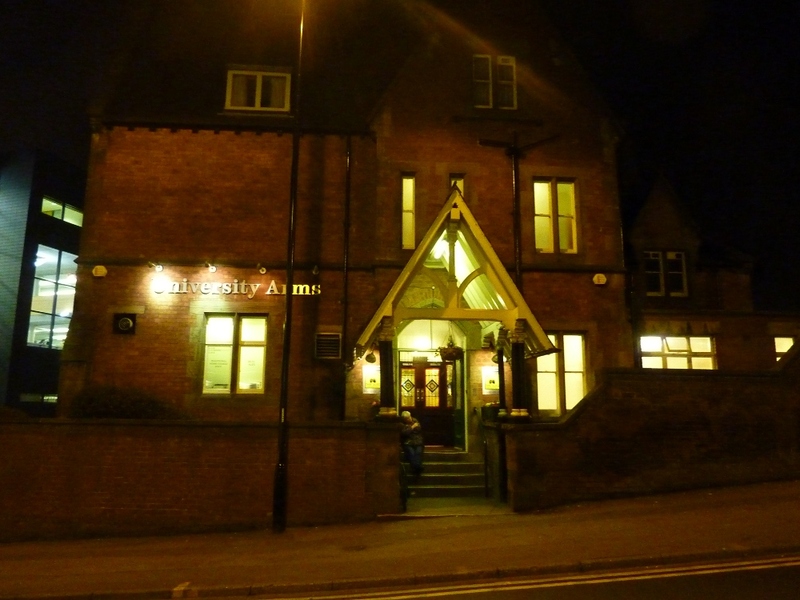 This pub is owned by Sheffield University and is cosy with a well-preserved interior with the bar filling one end of the long main room. 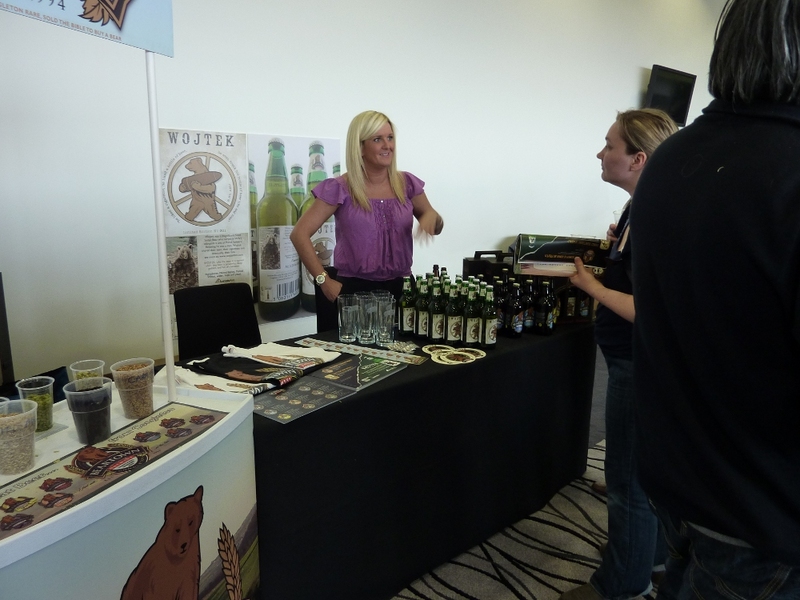 Six handpumps were in operation, offering a good range of beers and styles. Straight away, I spotted a Milton brew on the bar – Saturnalia. Having been impressed with Milton during a visit to their native Cambridgeshire last year (see here), I ordered myself a jar of that. I’m not quite sure what this is classified as, but it ticked all the boxes for an IPA in my book. It’s pale yellow in colour and has an ABV of 5.3%. The taste is superb, lots of hoppy bitterness with an excellent citrussy pithiness. A first class IPA. Next, I ordered half a pint of the unappetising sounding Acorn Ancient Grease. 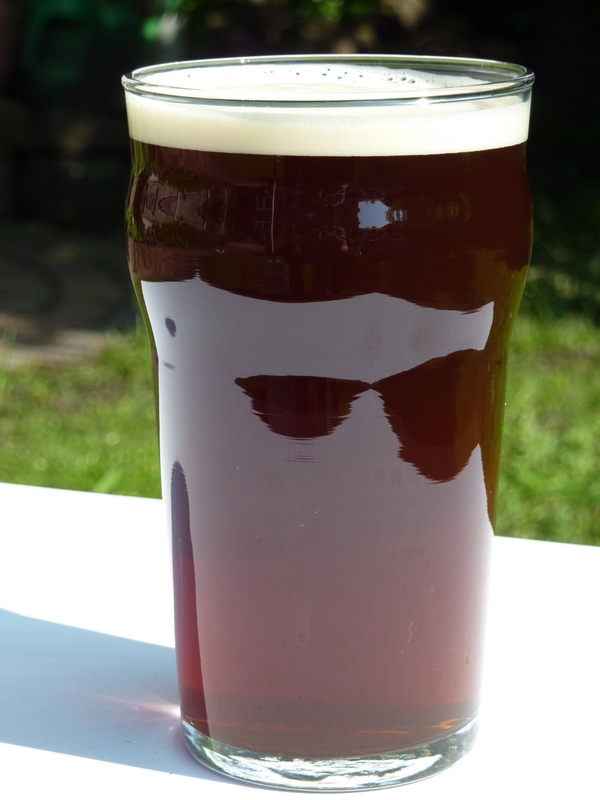 This is a dark beer, very deep red in colour, with a comfortably quaffable 4.1% ABV. There is a clear ginger aroma to this brew, and the ginger continues into the taste, where I also found a nice, smooth, chocolate flavour. It’s a curious combination, but it works surprisingly well, and I found myself enjoying it more than I expected from the name. There followed a couple of rather disappointing beers. Derby Masterplan, a 4% bitter(?) failed to raise any interest in its dull, boring taste, and Kelham Island Bohemian Rhapsody, a 4.7% bitter fared little better, being somewhat hoppy, but not terribly interesting. Time to move on to our last pub of the first day. I have to admit to being a little beer-weary by this point in the evening. I wasn’t drunk, just full. 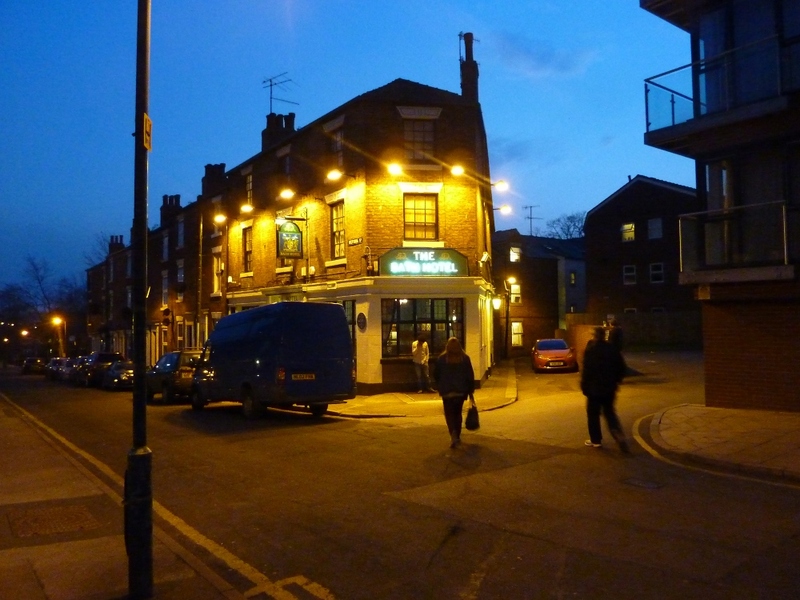 Imagine, then, my despair when we arrived at the Rutland Arms on Brown Street and found a bar positively bristling with handpumps dispensing beers from the Dark Star brewery. They must have had a Dark Star festival or something. It was, as I’m sure you will concur, not possible to pass up on such an opportunity, and before I could say ‘Slap me with a wet fish, Mother,’* there was a pint of Dark Star’s superb 4.2% Espresso Stout sitting on the table in front of me. Dark Star brewery, from Brighton, is one of my favourite brewers. Over the years I have sampled 32 different beers from this brewery. One disappointed and two I found to be average. That leaves 29 fabulous ales. The Espresso Stout was on top form, rich and malty with a huge wallop of coffee flavour. Not content with just one sample of Dark Star’s art, I followed the Espresso Stout with a Sussex Extra Stout, marginally stronger than Espresso at 4.5%, the taste is much more restrained. It is mildly malty with some hops present, but definitely not to the fore. The overwhelming taste is sweetness. A very drinkable stout. I slept soundly that night, and awoke the following morning keen to resume the crawl. To continue with the crawl, go here. * I have no idea why I might have considered uttering these words, and you may be relieved to know that in fact, I did not. Lady Alebagger and I recently had the great pleasure of spending eight days and nights in Rome. As we were not in a hotel, but in a rented apartment, we had to provide all our own food. So on our first afternoon in the Eternal City, our priority was to find a nearby supermarket for our needs. When we arrived at the apartment (in pouring rain) we were met by a lady who spoke no English, but went on to explain a great deal about the apartment, neatly ignoring our blank faces. Obviously, it would have been good if we could just have asked ‘Where’s the nearest supermarket?’, but ’twas not to be. Off we set, then, slowly spiralling out from our apartment (about 100 yards from the Piazza della Rotonda and the Pantheon). We picked up a couple of essential items at little shops (milk etc.) but it took us some time to find the first real mini-supermarket. 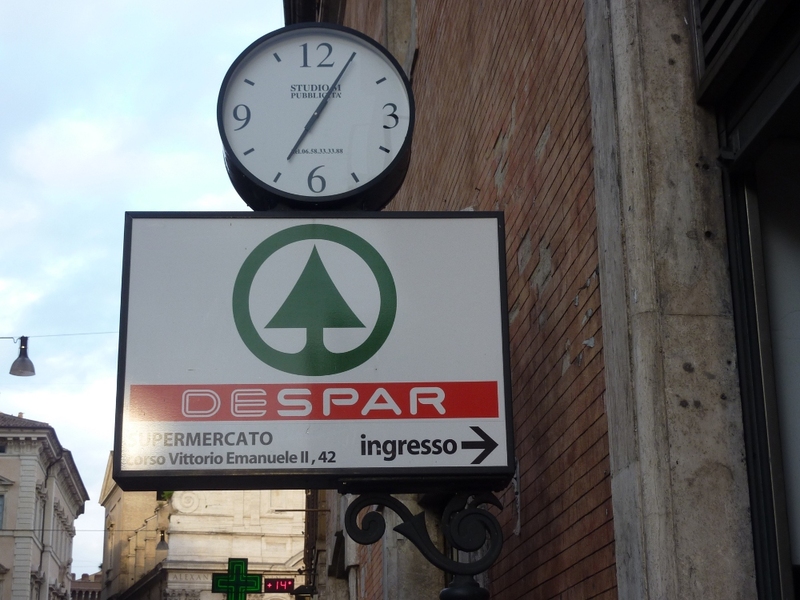 Of course there are no really big supermarkets in the centre of Rome, but we were delighted to find a Spar shop (or Despar, as it’s known in Italy) on the Corso Vittorio Emanuelle II, very close to the spot where Julius Caesar was murdered to death. As Lady A went off to ferret around and hunt for essential food-type stuff, she left me to look after the wheely-basket thing we’d picked up at the door. She should have known better. She left me next to the beer shelf. There were quite a few familiar brands on the shelves, brands that I wouldn’t touch with a barge-pole, but I noticed three beers that were new to me, so I surreptitiously slipped them into the bottom of the wheely-basket. The three beers, when I examined them more closely back at the apartment, turned out to be quite an international bunch: La Biere du Demon by Gayant in France, Ceres Stout from Royal Unibrew in Denmark, and Splugen from Poretti in Italy. The Ceres Stout is described on the label as a ‘double malt brown beer’ and promises ‘Doppio malto scura, ricca e corposa. Intenso aroma tostato e sapore unico’ (Double malt dark beer, rich and full-bodied. 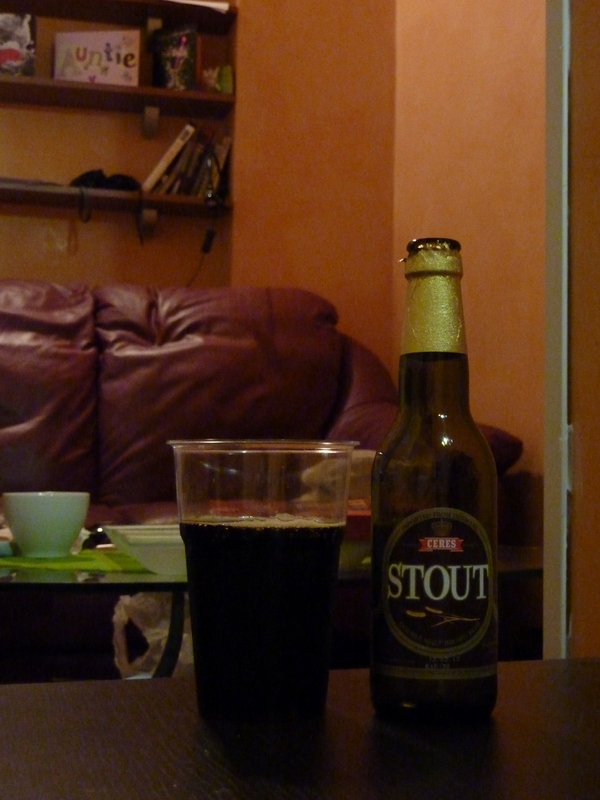 Intense toasted aroma and unique flavour.’) It is quite strong at 7.7% and is a deep black colour. The mouthfeel is thick and sweet with lots of treacle. There’s some small trace af malt in the flavour, but it’s mostly lost in the sweetness. Nice – worth a crack, if you can find it. The last of my Roman Spar shop beers was the pale orange Gayant La Biere du Demon (Demon’s beer), very strong at 12%, the bottle was disappointingly small at 25ml. The label says ‘La biere blonde la plus forte du monde. 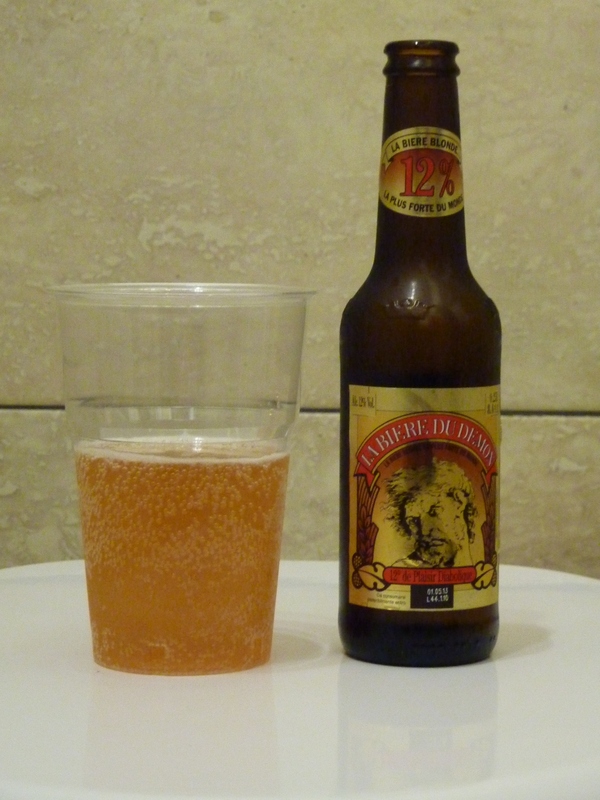 12° de plaisir diabolique’ (The strongest blonde beer in the world. 12% of diabolical pleasure). I was looking forward to this. 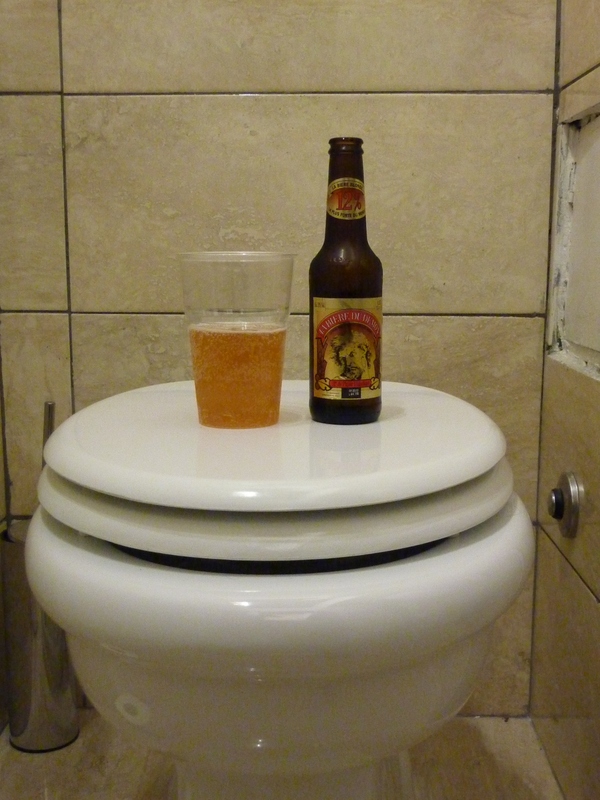 When I took my first taste it wasn’t quite what I expected, but it didn’t really disappoint. It’s sweet. The mouthfeel is slightly thick, but not as thick as you would expect from 12%. The beer holds a little fizz and there are hints of wheat in the taste. It’s not a complex flavour, but it’s pleasant enough. It really doesn’t taste like a 12% beer. Perhaps that’s a downfall. 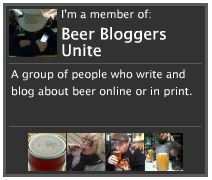 If I’m drinking a 12% beer I want to taste every one of those percentage points. This would have been fine for a 5% beer, but for 12% I expect a little more kick. Maybe if I’d had more than 25ml, I would have got it. 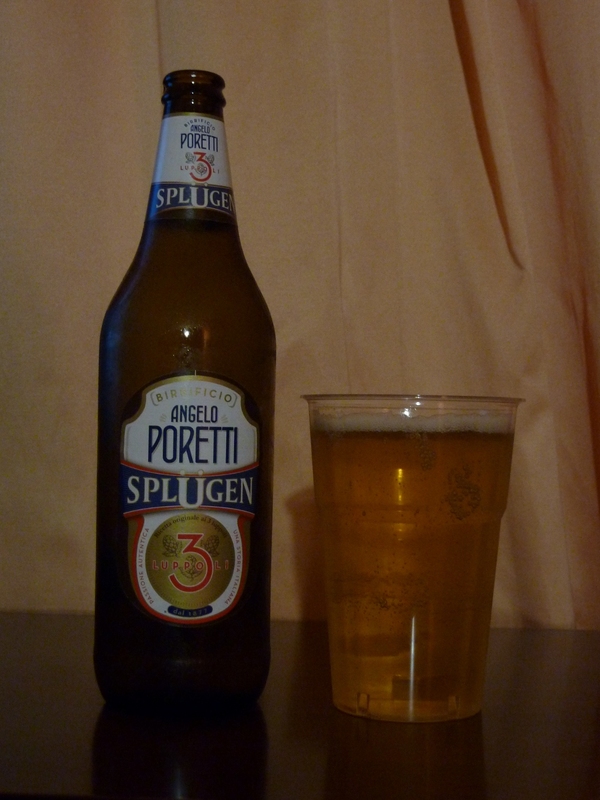 *OK, Splügen means a light coloured lager. Good word for it.